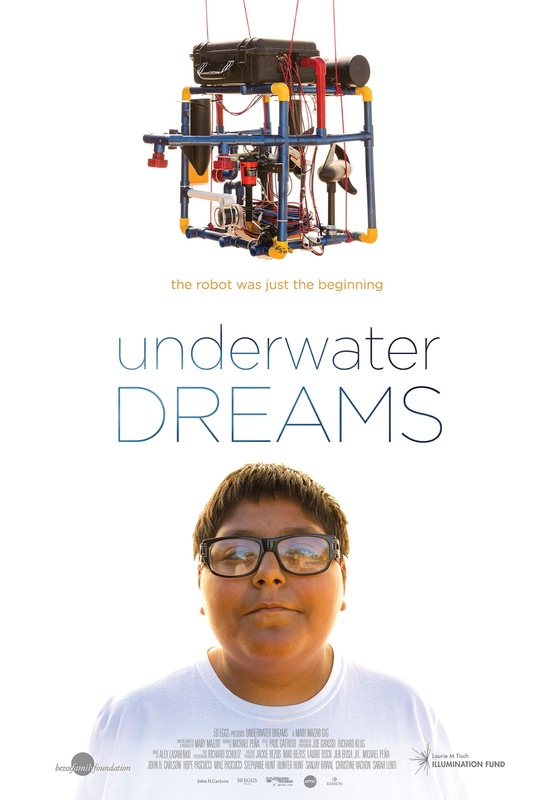 Grossmont College is hosting a free screening of “Underwater Dreams,” an inspirational documentary about the sons of undocumented Mexican immigrants who built an underwater robot as Arizona high school students in 2004 and defeated engineering powerhouse MIT in an international competition. The screening of the film on Tuesday, April 12, in Building 26, Room 220 will be followed Thursday, April 14, with a panel discussion at Griffin Gate in Building 60 with two of the former high school students featured in the documentary, Lorenzo Santillan and Luis Aranda, and the winning team’s coach, Allan Cameron. Both events start at 6:30 p.m. and are open to the public. Grossmont College is at 8800 Grossmont College Drive in El Cajon. The 2014 documentary about the ragtag team from Carl Hayden High School near Phoenix, Ariz., and its underlying theme of grit and determination overcoming obstacles was written and directed by Mary Mazzio and is narrated by actor Michael Peña. 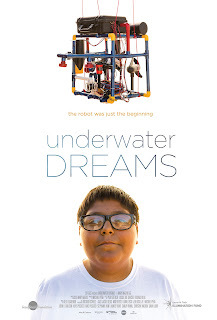 It was screened in 2015 at the White House as part of National Robotics Week. Heidi Borum’s epiphany came when she lost her son who was stillborn at 39 weeks. 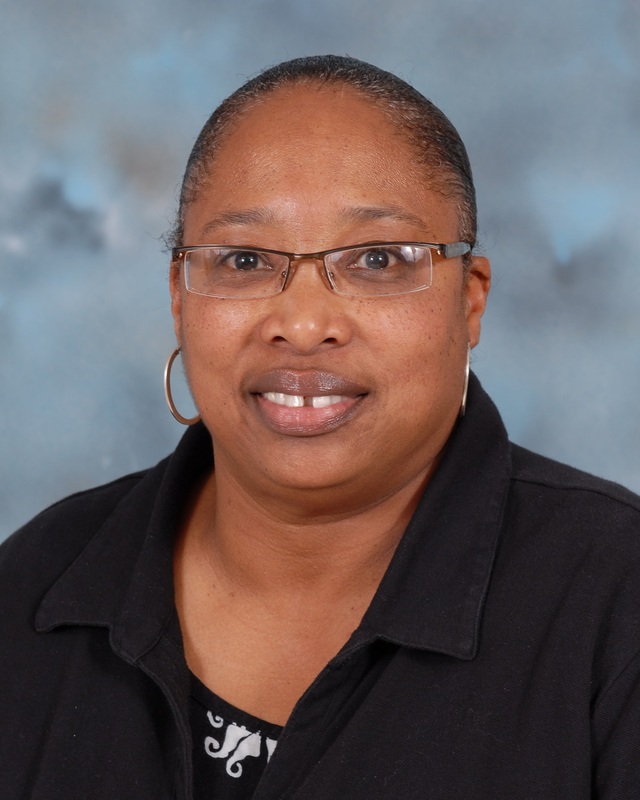 Just a few years later, Borum, 43, enrolled in the Grossmont College Nursing Program, where she is inspiring her fellow students while drawing inspiration from them. Her journey led to being granted a Christy Seiler Davis Memorial Scholarship during a recent awards celebration sponsored by the Foundation for Grossmont & Cuyamaca Colleges. 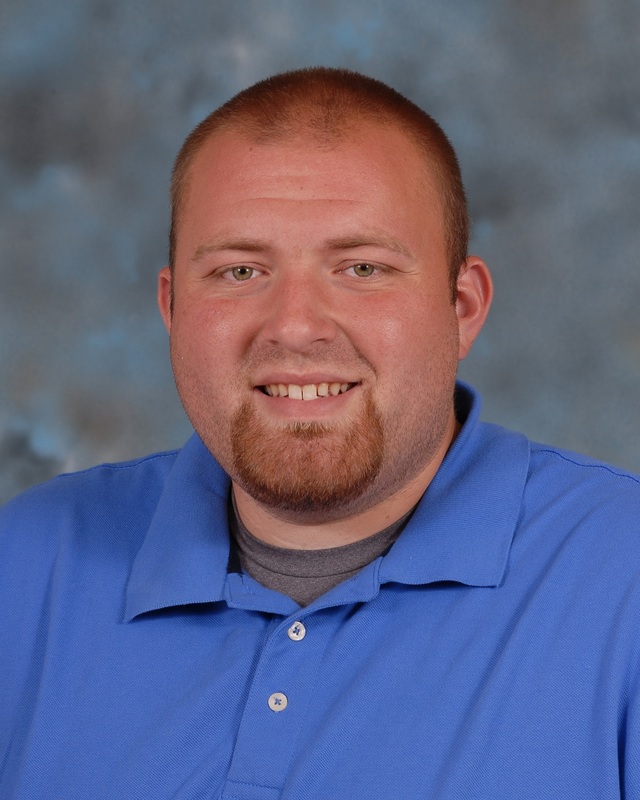 Cuyamaca College helped Ryan Shumaker find his future. Now he wants to pay it forward. 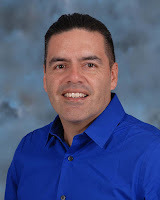 Shumaker grew up in a single-parent household with little thought of the future until he discovered the athletics program at West Hills High School in Santee. 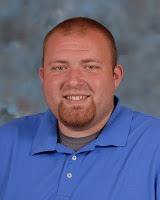 Shumaker played basketball, starred on the track and field team, served as captain for three years and set school records in the shot put and discus along the way. Unable to afford a university education, Shumaker looked at his options and enrolled at Cuyamaca College. 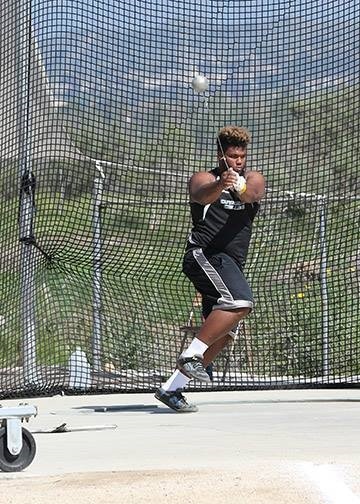 As a Coyote, he continued to shine in basketball and track and field, finishing fourth in the state in the discus and shot put in his first year at the collegiate level. A partnership between a college district and high school district in San Diego’s East County to provide a smoother path to college and a career has received a national Innovation of the Year Award from the League for Innovation in the Community College. The East County Education Alliance is a joint venture between the Grossmont-Cuyamaca Community College District and the Grossmont Union High School District designed to encourage collaboration between the two institutions so high school students are better informed about their college and career options. A major initiative was announced last year to provide a free year of classes at Grossmont or Cuyamaca colleges to qualifying high school graduates. Cathy Fritz remembers how nervous she was when she first enrolled at Cuyamaca College a generation ago. That’s why she is so committed to making certain the students she now serves today in the campus Counseling Center are made to feel at home as soon as they walk in the door. 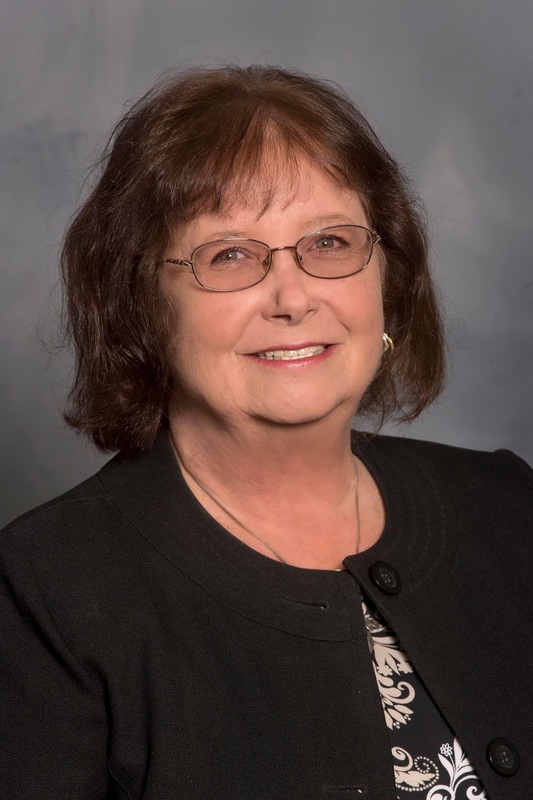 A native of San Diego who grew up in El Cajon, Cathy enrolled at Cuyamaca when she was in her 20s and had already given birth to two boys – one of whom would later graduate from Cuyamaca College. Her ultimate goal was to earn a master’s degree and work as a marriage and family therapist, but her plans changed after transferring to San Diego Christian College, where Cathy earned a bachelor’s degree in human development. 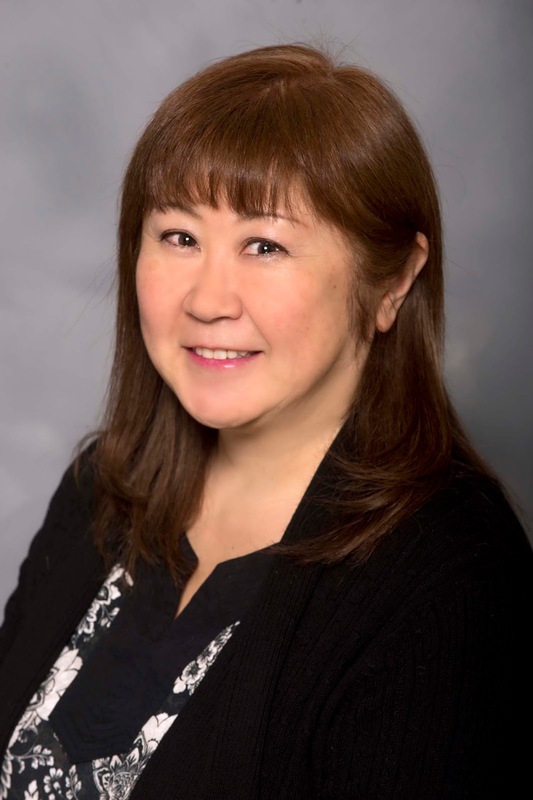 Instead, she continued to focus on raising her family – she and her husband have been married for 32 years – but returned to Cuyamaca College to work part-time at the front desk in the Counseling Center. 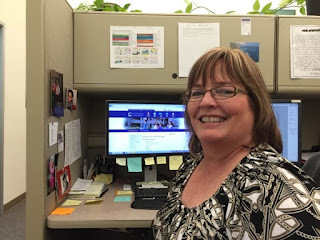 Now a full-time student services assistant, Cathy helps keep the office running smoothly by doing everything from setting up counseling appointments to staffing the front desk. 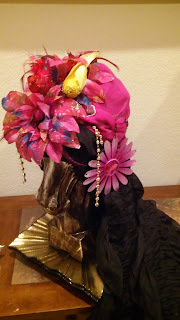 A headdress for the production. For 1,001 nights, Scheherazade eluded an untimely death by weaving tales with cliffhanger endings, keeping a vengeful king at bay. Again and again her life was spared so the king could hear what happened next. Arabic instructor Aklas Sheai’s take on the Middle Eastern fable of Scheherazade and the Arabian Nights will be performed 12:30-1:30 p.m. Wednesday, March 30, by about 50 of her students donning stunning hand-sewn costumes. This is the third year that Sheai, with help from her daughter, Asma Yassi, an adjunct counselor at Cuyamaca, and Raad Jerjis, an associate professor and counselor, will put on a free production in the college’s performing arts theater (Building B). .Also coordinating the event is Patricia Santana, chair of the college’s World Languages Department. The event is open to the public. 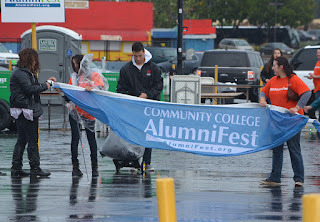 AlumniFest volunteers take down a sign as the rain begins. A torrential rain put the kibosh on the outdoor festivities planned for Friday night’s Community College AlumniFest, but the 2,300 tickets sold in advance for the post-event Gulls hockey game has sponsors vowing to bring back the event next year. 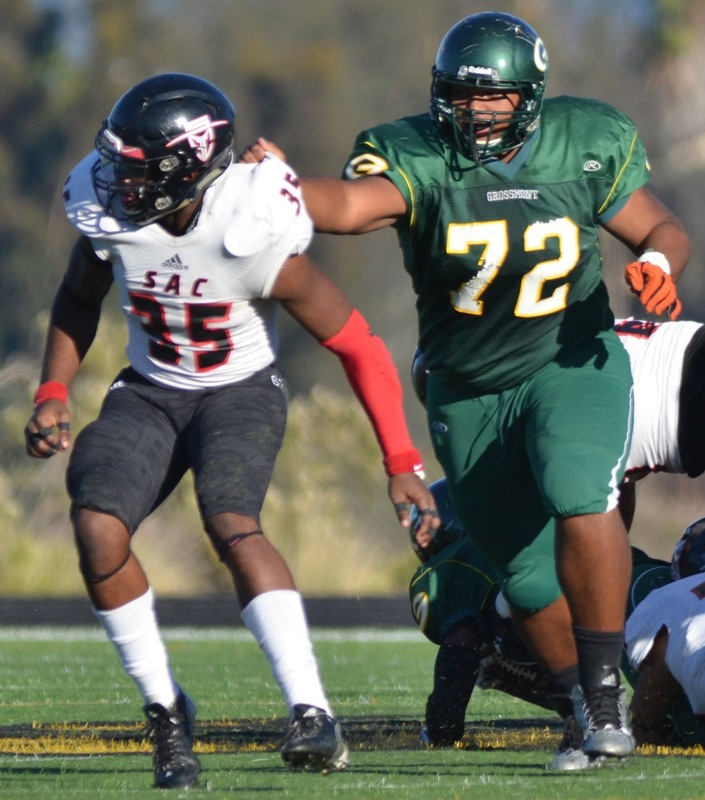 For most Cuyamaca College athletes, the idea of wearing the green-and-gold of the Grossmont Griffins wouldn’t feel quite right. For Jovann Letuli, it depends on the season. In the spring, he dons Coyote blue as a member of the Cuyamaca College track and field team. And in the fall, he lines up for the Grossmont College football team. His footwork seemed to work just fine at the recent Prairie War, as he bested his own Cuyamaca school record in the disc. His new mark of 52.79m topped the old one by over two meters. While he’s currently ranked #2 in the state for the disc, he’s planning to spend more time in the next couple years on the football field—more specifically, the University of Akron’s football field, where he recently accepted a scholarship. Two Cuyamaca College students have been named to the 2016 Phi Theta Kappa All-California Community College Academic Team – among the most prestigious honors for community college students in the state. 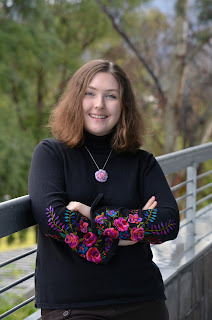 Associated Student Government President Mariah Moschetti, a computer engineering student who hopes to someday work for NASA, was one of 31 students named to 2016 Phi Theta Kappa All-California Community College Academic 1st Team. In addition, Moschetti was one of just 50 students nationwide selected as a Coca-Cola Community College Academic Team Gold Scholar, an honor that comes with a $1,500 award to help her further pursue her studies. Cuyamaca College standout Sophia Balanay, who will be transferring to Cal State San Bernardino in the fall to study psychology, was one of just 31 students securing a spot on the 2016 Phi Theta Kappa All-California Community College Academic 2nd Team. Moschetti and Balanay will be honored at the annual Phi Theta Kappa awards luncheon in Sacramento on March 24. 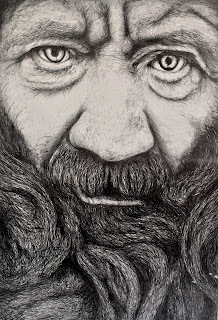 The craft of printmaking takes center stage when the Hyde Art Gallery at Grossmont College presents “Under Pressure: printmaking today,’’ an exhibit featuring works from 18 artists whose styles range from the traditional to the experimental. The exhibit, which runs March 28-April 28, is curated by Jennifer Anne Bennett, a professor of art at Grossmont College. Mission accomplished. Included is a display highlighting the traditional intaglio process, which involves etching an image onto the surface of a plate. The work by artist Kathleen McCord, includes the copper plate and details all 10 stages of the intaglio process, as well as the framed finished piece. Shirley Hughes began working in a financial aid office 20 years ago while still a student at Cal State Fullerton. 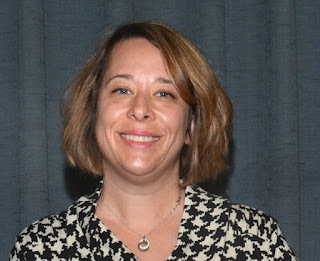 Today, Hughes is a Financial Aid Supervisor at Cuyamaca College, overseeing an office of eight employees who are dedicated to making sure students get all the help they need in securing critical funding. A native of San Diego, Hughes began her career in financial aid as a student worker at Cal State Fullerton. She was hired full time after earning a bachelor’s degree in business administration, working her way up to a front office supervisor and financial aid advisor before moving to Cuyamaca College 10 years ago. Students seeking financial aid at Cuyamaca College run the gamut and range in age from 18 to 83. Some days are busier than others, and it’s not unusual to see a line of students snaking outside the front door. Questions range from simply checking on their financial aid status to more complex special circumstances about their particular situation. “Many students have overcome seemingly overwhelming challenges to get to Cuyamaca and seeing them be successful in completing their goal is what it is all about,” she said. A rendering of a teaching and performance theater. A citizens committee charged with the oversight of the Grossmont-Cuyamaca Community College District’s Proposition V construction program has released its 2015 Annual Report to the community. Passage in 2012 of the district’s $398 million bond measure paved the way for the district to continue the work started with Proposition R – the $207 million facilities bond passed in 2002 that resulted in the construction or renovation of 13 major facilities at the colleges. Eight-week courses beginning the week of March 28 are a great way to pick up general education or subject-specialty classes in less time, but at the same affordable cost of regular semester-length classes. The classes ending May 21 offer from one to five credits at a cost of $46 per unit. They consist of traditional, online and hybrid classes, which require both in-classroom and online attendance. That’s the message from career counselors at Cuyamaca and Grossmont colleges, who say students should investigate their interests and what interests them before choosing a major and embarking on a career path. 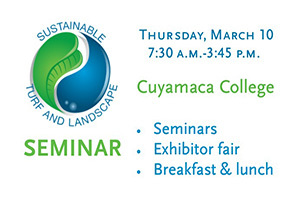 The Eighth Annual Sustainable Turf and Landscape Seminar set for March 10 at Cuyamaca College will focus on the value of landscaping in light of the drought that has plagued California. 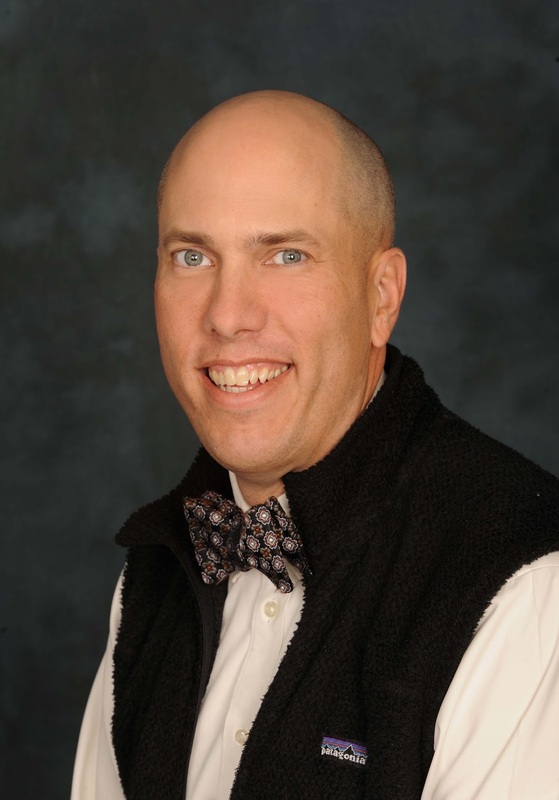 The keynote speaker for the conference will be Glen Schmidt, a leading landscape architect in the region, who will be discussing how a San Diego style of landscaping should be developed with a growing awareness of sustainability issues. If you’re one of the vast numbers of community college alum in San Diego and Imperial counties, mark your calendar for an event tailor-made for you: the first-ever Community College AlumniFest set for Friday, March 11, featuring Gulls hockey and a pre-game bash for just $10. Even if you took just a single class, you’re a community college alum in our book, so join this celebration at Valley View Casino Center – located at 3500 Sports Arena Blvd, San Diego, CA 92110.